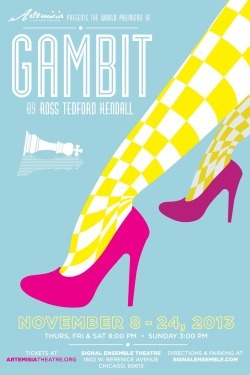 The Chicago Chess Center and Artemisia theater company invite you to the world premiere of Gambit, a new play by Ross Tedford Kendall, on Sunday, Nov. 17, at 3 PM. The show, which stars Suzanne Petri and Miriam Reuter and is directed by Julie Proudfoot, will be performed at Signal Ensemble Theatre, 1802 W. Berenice Ave., Chicago. Directions and parking information are available at signalensemble.com. Nov. 17 is Chicago Chess Center Day: attend the matinee show and receive $10 off the $25 ticket price. Tickets may be ordered on the Artemisia website; use coupon code art4gam2013 to receive your CCC discount. Stay after the show for a reception with the play's cast, director and artistic team! Artemisia's mission is to produce plays that tell "female-centered" stories through the experience of leading characters who are women, daring audiences to think beyond what's considered "typical" and "appropriate" feminine behavior. Chess is a universal language, a compelling tradition that's given us an abundance of social and political metaphors and themes, and we're pleased to have the opportunity to share this contemporary theatrical work that uses them to tell the story of two generations of unconventional women.